David Thompson is the associate director of the Mississippi State University (MSU) Center for Advanced Vehicular Systems, where he is CFD Group Lead. Since joining MSU in 1998, his research has focused on mesh generation and refinement techniques, including those that employ general polyhedral elements, vortex detection and visualization, aircraft icing, biomedical flows, and vortex-dominated flows. DT: Dealing with massive amounts of data. With the maturation of massively parallel systems and fast processors (GPUs), we solve larger-scale problems or more problems. In either case, the main problem is not the obtaining the solution. It is data management during preprocessing and postprocessing. JC: You mention GPUs specifically. We did a pilot project on them last year and found that the effort (to code, maintain, debug) wasn’t worth the performance improvement. Can you say more about your GPU experience? DT: I don’t have any personal experience with GPUs, mainly because I haven’t had access to them. One of our research faculty members is collaborating on a project with Drexel University to perform turbulent flow simulations using GPUs. The project is still in the early stages so he doesn’t have any hard performance numbers yet. My primary reservations, from afar at least, are the ones you mentioned and the problem of legacy code. Of course, regardless of whether you go GPU or not, the problem of data management remains. JC: Also, can you say something more precise about the size of some of the simulations you’re working on? DT: The problems I have been working on have not been “large” spatially, with the largest being only about 20M – 50M elements. The size issue arose because they were unsteady simulations that required saving numerous time steps. Altogether, a set of these simulations is about 20GB or so. We are getting ready to perform some unsteady simulations that will require 100s of GB but not quite a TB. Here’s an example of a particularly memorable simulation. The objective was to redesign a droplet delivery device for small-scale, refrigerated wind tunnel (Figure 1) that minimizes droplet deposition in the device and droplet scatter in test section. Figure 2 shows droplets and the delivery device with transparent surfaces. 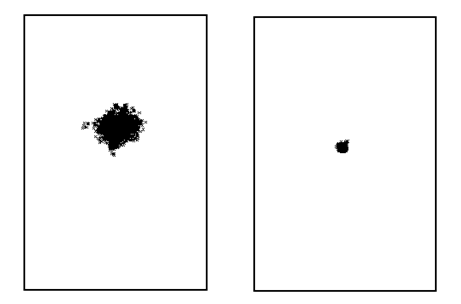 Finally, Figure 3 shows the reduction in droplet dispersion of the redesigned device over the baseline. 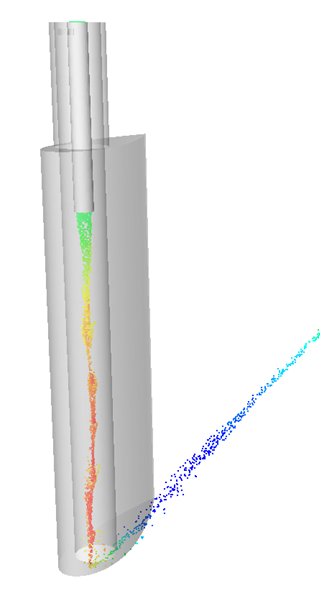 Hybrid RANS/LES was used to simulate unsteady turbulent flow. Figure 1: Overall view of refrigerated wind tunnel including droplet device (left) and test section (right). Figure 2: Droplet delivery device with transparent surfaces to show droplets. 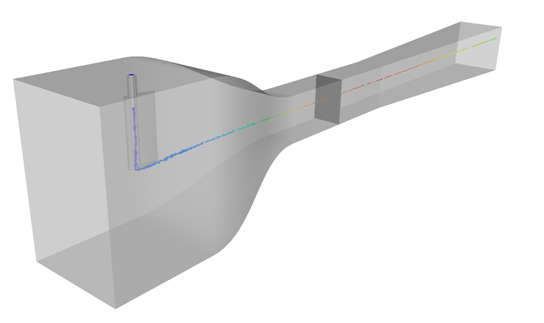 Figure 3: The droplet dispersion in a plane perpendicular to the test section flow was reduced by the redesigned device (right) relative to the baseline (left). DT: I got my B.S. in aerospace engineering from MSU in 1979. I worked for Joe Thompson as an undergraduate researcher and then continued working with Joe to get my M.S. in aerospace engineering in 1980. I moved to Iowa State University to work on my Ph.D. with Dale Anderson and completed that degree in 1987. I always knew that I wanted to be in aerospace engineering. Of course, I had no idea what CFD was in 1978. That was when Les Hester, who taught a few undergraduate courses at MSU, introduced me to Joe Thompson. I started working for Joe and one thing led to another. Dale Anderson, who was my Ph.D. advisor, was also a great mentor, but it was really Mr. Hester and Joe who got me into CFD. I worked at General Dynamics/Fort Worth Division (1980-83) in the Aeroanalysis Group. I was on the faculty at UT Arlington (1987-94). I also took a brief detour into K12 as the director of the academic program at a state-supported residential high school for gifted and talented 11th and 12th grade students (1994-98). While the job was extremely stressful, I learned a lot; however, I decided I wanted to get back into CFD, which led me back to MSU where I joined the research faculty (1998) and moved into a tenure-track position in 2003. JC: It’s fair to say that anyone doing CFD mesh generation in the 1980s was influenced by Joe Thompson, either personally or through his work. Wouldn’t you agree? JC: And Dale Anderson was my M.S. adviser and John Steinbrenner’s Ph.D. adviser. There’s a lot of common influence there. DT: I had the good fortune to grow up in the 1960s. In fact, I like to think that I lived “The Wonder Years” (late ‘80s early ‘90s TV reference). While there was a lot of turmoil, there were two specific events in 1968-69 that had a profound impact upon me: 1) on Christmas Eve 1968, I heard the Genesis story read from a spacecraft orbiting the Moon (Apollo 8) and 2) in July 1969, I watched grainy images on a black-and-white TV of a man actually walking on the Moon (Apollo 11). It would be three, except that on Apollo 12 the color camera was destroyed when it was accidentally pointed at the sun. To this day, I seem to have a grudge against Alan Bean. Apparently, I think it was his fault. JC: We recently watched Space X’s Dragon capsule dock with the International Space Station. I don’t think anyone would argue that it was as momentous as the lunar landing, but do you think it will have the same impact on young people today? DT: I would say both no and yes. No because I don’t know how many young people were actually paying attention. Everybody knew about the Apollo missions. Yes, because this is a necessary step toward the commercialization of space, which may affect their everyday lives more directly. Don’t trust anything you get from a CFD code. There is a reason we do mesh refinement studies. Any monkey can run a code. Your value-added as an engineer is through the interpretation of the results. JC: That may some of the best advice for CFDers that I’ve ever heard. DT: I knew John Steinbrenner from Iowa State and Rick Matus from UT Arlington. I was familiar with the mesh generation work that had been done in the CFD Group at General Dynamics in the mid-1980s. I also know Carolyn Dear from her days at MSU. JC: Let’s not forget about the AIAA Meshing, Visualization, and Computational Environments technical committee, for which you and I have served as chair. Mesh generation: I use our in-house mesh generation system SolidMesh/AFLR almost exclusively. Flow solvers: I use our in-house flow solver Loci/CHEM, that was developed with funding from NSF and NASA, for problems for which density-based simulations are appropriate. I have been experimenting with OpenFOAM® for some incompressible simulations. Occasionally, I use ANSYS Fluent®. Vis tools: I use EnSight® because I like the interface and toolset. DT: It depends on whether you want the “Southern Experience” or not. The Little Dooey is a barbecue place that the people at EPSN love. Of course, like most places, the best barbecue is served in dives. For all you Texans – get pork. Don’t get beef. Get pork. Trust me. This entry was posted in People & Places and tagged EnSight, Fluent, Loci/CHEM, OpenFOAM, SolidMesh. Bookmark the permalink. Impressive article about a subject I am not familiar with, but a person I am pleased to be kin to! 🙂 I enjoyed reading the different bits of information, and getting an insight on a day in the life of David Thompson! enjoyed a lot reading this blog post, the part I liked the most was “Any monkey can run a code. Your value-added as an engineer is through the interpretation of the results”. Cesar: I agree. It’s absolutely true. Interpretion of CFD also applies to 6DOF flight simulation results but I agree wholeheartedly with Dave’s advice. You can’t take the engineer out of the loop. I had the privilage of carpooling with Dave to General Dynamics – great guy, good sense of humor and very sharp. Hi Charles. You are correct – engineering judgement is different from using tools. David and I also spent time together at GD and there’s one funny story involving David and security that still cracks me up.